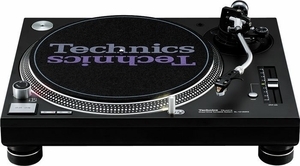 The Technics SL-1210MK5 Pro Turntable is a quartz direct-drive manual turntable with brushless DC motor that provides everything pro disc spinners require and then some. Aluminum die-cast platter, 1-1/2kg/cm torque for quick starts, bass-absorbing rubber bottom, S-shaped arm, shell stand, slipmat, and 6g anti-skating weight deliver high-powered performances. +/- 8% pitch control, brake speed control, long-life white LED, and illuminated stylus.